Farmers in in the West pay low rates to the federal government for water, 1/8 the cost for a municipal department cited in the article, and yet farms are allowed to sell water they don't use and keep the profit. Many California contracts are finalizing this year, and many more are due for renewal. These policies were intended to help small farmers, as with subsidized crop payouts, but both policies are now paying corporations most of the subsidy, helping them drive out the family farmers. Environmentalists say doubling the price of water to farmers (which would still leave them a huge discount) would reduce water use 30%. Eliminating the subsidies could save enough water to supply Los Angeles, according to critics of water policy. SAN FRANCISCO -- A half-century ago, the federal government moved mountains and harnessed rivers to convert California's Central Valley into some of the nation's most productive farmland, fed by subsidized water at rock-bottom rates. Now, many of those cheap-water contracts are up for renewal, rousing critics who argue that the government should increase its rates, both to generate more revenue and encourage farmers to conserve. The critics include both fiscal conservatives and liberal environmentalists. Aileen Roder, the program director for Taxpayers for Common Sense in Washington, calls the contracts "a raw deal" for taxpayers. Barry Nelson, a senior policy analyst for the New York-based Natural Resources Defense Council, says farmers should "get off the welfare rolls." But officials at the U.S. Bureau of Reclamation, which runs the system of dams and canals known as the Central Valley Project, appear ready to renew the contracts for as long as 25 years with few changes. Under decades-old policy, the farmers pay the federal government a set fee for water stockpiled by the project. Bennett Raley, an assistant secretary of the Interior Department, says the reclamation bureau, which his office oversees, wants to provide farmers with an economical source of water. "We don't think it's good for California or the nation to adopt punitive pricing proposals that might have the effect of driving more agriculture out of existence," he says. Farmers are charged a lot less for water from California's Central Valley Project than are urban and industrial users. A spokesman for the Bureau of Reclamation, Jeffrey McCracken, adds that the agency is trying to adhere to policies outlined by Congress beginning in the 1940s that gave farmers a price break on water, compared with urban and industrial users. He notes that the farmers' rates have been increased recently to accelerate payments to the federal government, but that they're still nowhere near many of the urban rates. In urban San Jose, Calif., for example, a water agency pays about $80 an acre-foot for water from the Central Valley Project. Just 50 miles away, farmers in the Central Valley pay as little as $10 an acre-foot. An acre-foot is 325,800 gallons, or roughly as much water as a family of five uses at home in a year. Critics say that by not moving to substantially raise rates now that it has the opportunity, the Bush administration is favoring its traditional allies in agricultural areas. "These contracts look like a pure payoff to people who have been politically and financially supportive to the Bush administration," says John Lawrence, an aide to U.S. Rep. George Miller, a Democrat from the San Francisco Bay area. Assistant Secretary Raley denies there are any political motives. Many of the new contracts are expected to be finalized this year. What the government chooses to do could have implications far beyond California, because hundreds of old contracts supplying cheap water to farmers will soon expire across the arid West, where federal irrigation projects made deserts bloom. The dispute is also adding a new chapter to the West's storied water wars. Ever since Los Angeles diverted water from the eastern Sierra Nevada, drying up Owens Lake by the 1920s, cities, states and federal agencies have been fighting over how to divide up the arid region's scarce water resources. 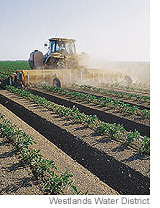 A particular point of contention has been the amount of water used for agriculture. Because farmers in California use the majority of the state's water, officials in urban areas like Los Angeles and San Diego have long complained that agricultural users need to conserve more. Federal public-works projects made large-scale irrigation possible, and the biggest of these efforts was the Central Valley Project. Authorized in 1935, the system routes water from the Cascade Mountains near Oregon and the Sierra Nevada on California's eastern flank through 20 dams and more than 500 miles of canals. It allowed farmers to vastly increase planting in the 400-mile-long Central Valley, particularly in the region south of Sacramento, where water is scarce. Under the current contracts, the rates charged to farmers don't include any of the interest on the financing for the $3.6 billion project; urban and industrial rates do include interest. Critics say that eliminating the agricultural subsidy could raise hundreds of millions of dollars for the federal government and result in a big enough increase in water conservation to supply a city the size of Los Angeles. The state Department of Water Resources estimates that doubling water prices would reduce water use roughly 30%. Environmentalists also argue that higher water rates could change what crops are grown in the California agricultural industry. For example, they say, alfalfa consumes roughly one-quarter of the state's irrigated water, but it produces only about 4% of California's agricultural revenue. But farmers say that most of the 20,000 growers who take water from the Central Valley Project already use drip irrigation or other water-saving techniques. And they say they have plenty of incentive to conserve because the seemingly low rates at which irrigation districts buy water don't reflect the actual rates charged to farms. The Westlands Water District near Fresno pays $37 an acre-foot for its federal water. But after tacking on distribution costs, the district charges farmer Dan Errotabere more than twice that, or roughly $80 an acre-foot. Mr. Errotabere says his family uses about 9,000 acre-feet of water a year -- at a cost of $720,000 -- to irrigate 3,000 acres of lettuce, tomatoes and other crops. Eliminating the agricultural subsidy would increase his water bill as much as $360,000 a year, he says, potentially forcing him to reduce planting and lay off some of his 15 workers. Competing in a global market against farmers with lower costs, Mr. Errotabere says he has little room to raise prices. "The hardship would be extraordinary," he says. Farmers also say they're already suffering because environmental restrictions have reduced their water allocations in recent years. The 600,000-acre Westlands district, as big as Rhode Island, has received only slightly more than half of its 1.1-million-acre-foot annual allotment in each of the past six years, officials say. As a result, farmers have been forced to tap groundwater, which can cause land to sink, or to buy more expensive surplus water from other districts. But environmentalists point to the practice of some farming districts of selling their unused water as further evidence the system needs to change. While the water-selling farmers say such sales allow them to bolster their meager incomes, the environmentalists say the federal government is losing out because the water is being resold for several times its original cost. "This," says the NRDC's Mr. Nelson, "has become an arbitrage opportunity."